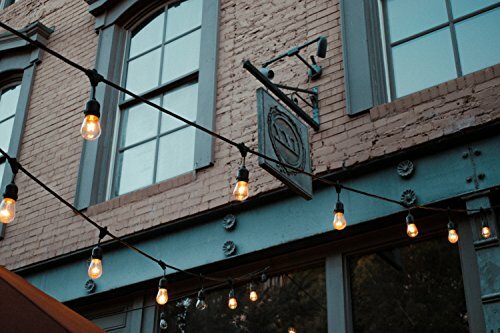 ❶Transform Your Outdoor Space – Outdoor string lights provide endless options to transform your backyard or outdoor space into something magical. They will add a touch of elegance to your outdoor wedding, cocktail party, gazebo, porch, patio, outdoor dining area, and so much more. ❷Strongest Weatherproof String Lights - The UL listed, SJTW-rated cable is flexible enough to arrange your lights however you want, but durable enough to withstand extreme hot or cold temperatures, you can be confident that your lights will continue to shine through summer and winter, all year-round ❸Energy Efficient LED Bulbs – The LED Bulbs has longer lifespan than tungsten filament, and more brighter, power saved. 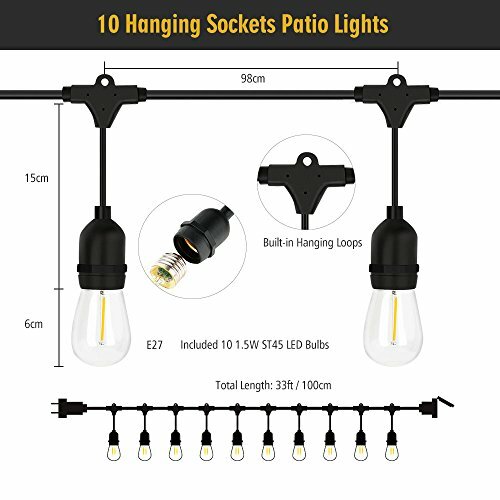 Each strand contains 10 hanging bulbs spaced 3.2 feet apart.Our LED lights are approved for residential and commercial lighting and they never get hot even after burning for hours. ❹Simple Installation – Each socket has a loop on it for easy installation with eye hooks, zip ties, or guide wire. 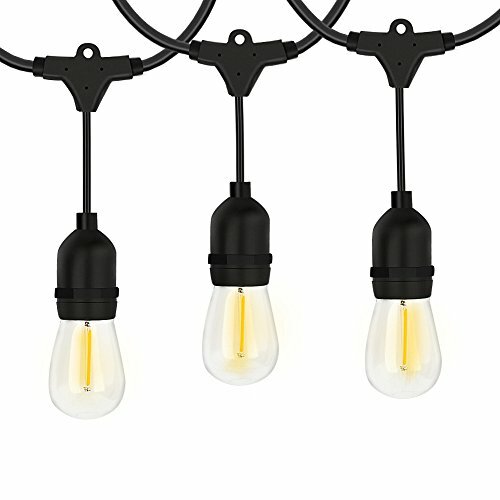 Connect up to eight strands together end-to-end, then customize your space with a canopy of light or chandelier-style groups. ❺End to End Connections – These strands can be plugged end-to-end. You can plug several strands together to extend the string light length. UL listed for commercial use. 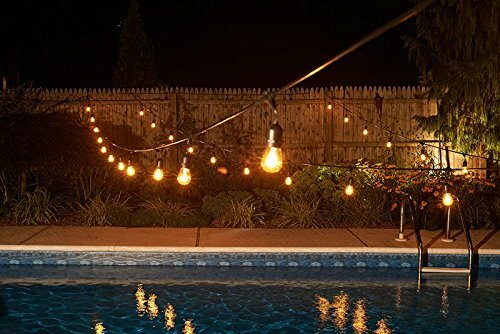 The iEGrow LED string lights are the perfect addition to your backyard, patio, or garden. These UL Listed lights are coated in a tough rubber casing so they will withstand even the toughest weather conditions. Our heavy-duty rated cable is well-insulated so you can leave these outside all year long. 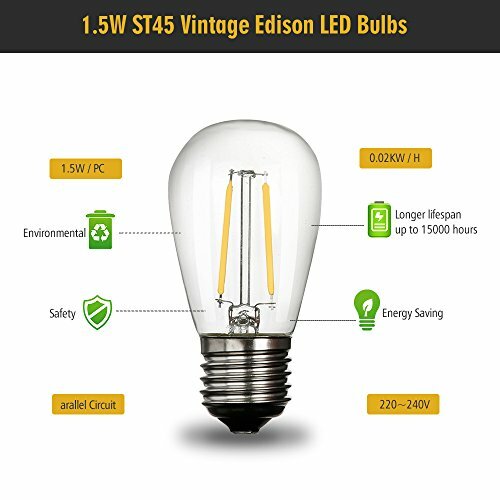 This set includes 10 standard base 1.5-Watt S14 Edison-style LED bulbs that shine with a warm glow to create an inviting atmosphere for parties, events, or just relaxing at home. Connect up to eight strands together with no hassle, they plug directly into one another. These lights are also compatible with dimmers to give you even more options. 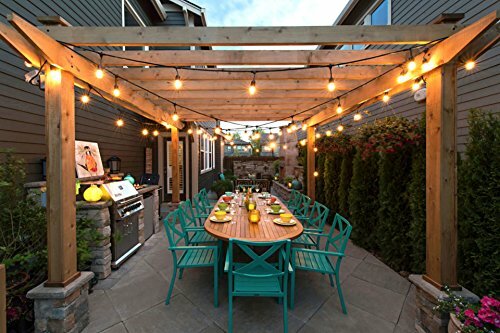 Our 33-ft. Indoor and outdoor string lights let you arrange strands in a variety of different configurations, giving you ultimate control over your surroundings. String them between trees or along a fence line, or in clusters around your space.